When I work on complex research problems or receive a thick packet of research from a client, one of my first steps is to create a timeline. With a timeline, you always have the basic details of people, events, and locations at your fingertips. The visual aspect of a timeline helps me see information in a different way. A nice bonus is that when I create a timeline, I am forced to review every scrap of information at least once. It is amazing the amount of overlooked information you find when you do this. Timelines help us get a grasp on who is doing what, where, and when. They are great for "visual" people to get handle on all of the data that they've been collecting. Having it in a visual, graphic format can help not only to identify gaps in your research, but also to resolve data that conflicts and to strategize about what to look for next. Do not view your timeline as a one-time use document; consider your timeline as an organic document that will evolve as your project progresses. Not only do I reference my timelines for already collected information, I am continually adding newly-found information. Timelines do not have to be like the classic, two-column ones where the left column is time and the right is some event. Frequently, we need to move beyond a simple linear timeline and create a matrix of multiple people or families when using this technique to solve a genealogical research problem. Most of the timelines I create use a matrix format. If you are not sure which type to create, I suggest constructing a matrix timeline to capture more, rather than less, information. Whenever I create a timeline, I always put the date in the leftmost column with an adjacent column for "where" and then columns for the various "who" (individuals, family groups, etc. ), with the rightmost column for notes. The notes column is a great place to pose questions. For example, the 1870 census lists John's wife as Tabitha and the 1860 census lists her as Mary. Are they one and the same or two different people? I will often highlight these questions in bold yellow to make sure I remember to pursue the research. In essence, I've just created a strategy for my next phase of research. Use color coding to separate different counties, when more than one locale might be involved, or separate out entries for an individual. Color-code and/or denote different names that repeat within your timeline. There are sometimes names, for which you do not have a column and yet provide a "linking thread" through the data. Make sure you differentiate individuals who share the same name. Be sure to put their names along with uniquely identifying information as a column header. Changes in law. Dower rights, inheritance rules, and tax laws all impact what records our ancestors appeared in. Historical events, such as military conflicts, epidemics, and natural catastrophes. Seeing that your ancestor was aged 22 in 1861 is a clue that you should look for possible Civil War service. Personal milestones, such as turning age 21 (which can be a clue to look in more records, such as for taxes). Local catastrophic events, especially those that impacted records (e.g., courthouse fires). Basically, I would include an entry or note about anything that might explain record losses, impact how you interpret the information you have on your ancestor, or suggest where you next might look. 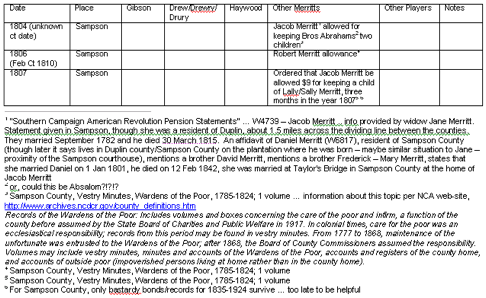 Extensive use of footnotes provides additional information about specific entries. This allows the timeline itself to still be concise while not losing key source information, context, and additional information that might be significant. It does make your timeline larger; however, the core data is in an easy-to-read format. Historical context items have been included; these are the grey-colored entries in this example. Geographic context is important. Color-coding different locales can provide perspective on the pattern of migration. It may also show you that who you thought was one person may actually be two identically named individuals. Color-coding names can make things more obvious by helping us see how people are associated. It might help us learn, as in this example, that one Thomas is connected to a William and another to a John. We might also see that one person is consistently listed adjacent to and in the records of an unrelated individual, whereas another same-named person is never found in those records. Keep name spellings as exactly as you see them in the record. This helps you keep track of name variants; subtle changes in names might have significance. The same is true for names of locations. Similarly, track whether a person signed their name and how or signed with a mark and what that mark is if mentioned. Seeing differences in signatures or marks can help distinguish people of the same name. Always put elements in chronological order. No detail is too small or unimportant. Though, if you ancestor was constantly in one set of records over a certain time period, it's okay to use a date range. For example, your entry might read "1787-1795, served as a juror." Use abbreviations to make your entries as short as possible; for example, adj for adjacent, dau for daughter, etc. Use the smallest fonts you can. I will often use a 9 or 10pt font for my important entries and then an 8 pt for secondary items. Make your matrix as large as needed. In Word you can use landscape mode or choose legal size paper; in Excel you can make a table as wide as you want. When looking on your computer screen, it doesn't matter what size paper your document is set up for. However, if you will be printing out your matrix, I suggest sticking to the size paper that your printer can accommodate. If you don't have a color printer, use techniques to distinguish entries that can be easily spotted in black and white such as bold, italic, underline, different fonts, use of symbols (*), or combinations of these. Be very clear about which items are "documented," which items are clearly your ancestor (based on corroboration from other sources), which items are conjecture (e.g., birth date c1785 based on census) and which items may or may not be your ancestor. When sharing a timeline with another researcher, I will often highlight information that is "new" since the last time it was shared. This allows the other researcher to quickly appreciate any changes. 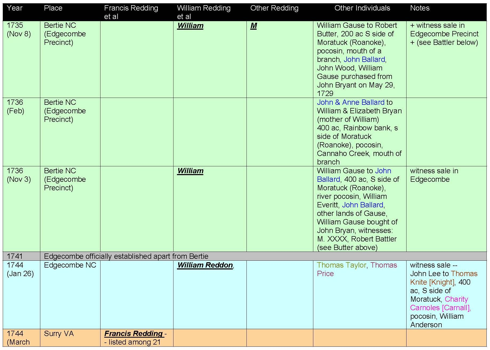 Timelines are an important research tool for our genealogical research. These tricks of the trade can help your timelines effectively reflect known information, answer key questions, and simplify setting your research strategy. Creating a timeline to facilitate your ancestral research is time well spent and definitely something that you will not regret creating.